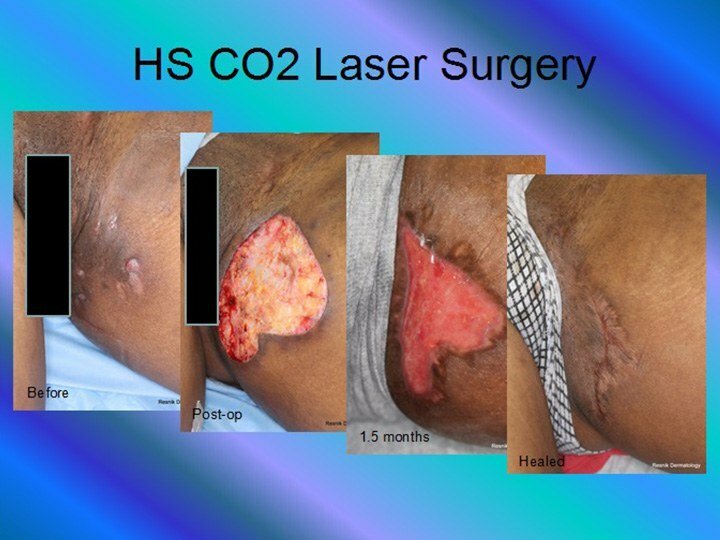 We offer staged CO2 laser marsupialization surgery to treat persistent individual lesions of Hidradenitis Suppurativa, as well as the interconnected paths and scarring masses. This technique allows us to find and remove sinus tracts and extensions that would not otherwise be visible. This attention to detail gives us a more successful approach than with other methods. Recurrences are low, and the resulting scars are very acceptable, in place of the constantly irritated and infected Hidradenitis Suppurativa. The surgeries typically performed for this condition involve removal of large blocks of tissue. In order to close these large defects, extensive suturing or meshed skin grafts are used. This very often results in ugly scars that often restrict range of motion. To add insult to injury, this practice of making huge holes is not necessary. Hidradenitis Suppurativa is a disease of follicular plugging. Removing the skin and scar tissue removes the disease. Patients are treated in the outpatient setting. Although it can be done in the office, most people prefer the comfort and safety of general anesthesia at our state-of-the-art Biscayne Plaza Surgical Center. 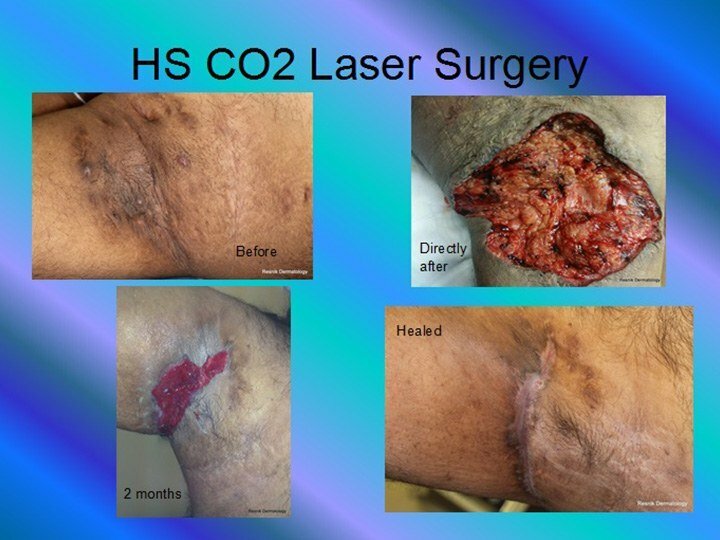 (www.biscaynesc.com) The CO2 laser is then used to cut around and under any areas of tunneling, scars or inflammation. Only the skin is removed, leaving exposed fat. By examining the periphery of the surgical site, it is possible to discover hidden tunnels of affected skin - the presumed reason why so many other approaches fail. All affected tissue is removed, and the laser is then used to produce a smooth interior wound. Total time for the procedure is normally 2 1/2 -3 hours. Wound healing takes place naturally, initially filling in the depth of the area, and subsequently healing the surface skin. Because no muscle is disturbed, healing is generally comfortable, with only a surface dressing and daily bandage change. Healing is usually complete after 8-10 weeks. Qualities of healing have been acceptable to excellent, and no patient has required scar revision. Complications from the staged CO2 marsupialization laser approach are rare. 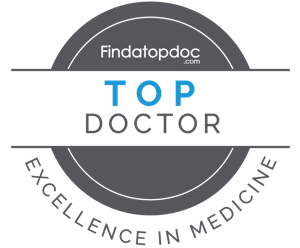 Bleeding, discomfort, delayed healing, infection, scarring and recurrence are all possible but are uncommon. It is important to remember that there is a limit on the size of the area which can be treated at one session and that healing will be gradual, normally over a period of weeks. The size of the area to be treated will influence the convenience of the patient post-operatively; larger areas will be more challenging for care. For both reasons, a substantial area will occasionally be completed in two sessions. Similarly, the individual with multiple areas will also often require multiple sessions. Again, the advantages of performing the surgery in the outpatient setting, with no hospital stay, and with good comfort postoperatively have made this approach an attractive option to many patients. If you are tired of the horrible aftermath of Hidradenitis Suppurativa, consider this revolutionary procedure.